GameSpot’s early access reviews evaluate unfinished games that are nonetheless available for purchase by the public. While the games in question are not considered finished by their creators, you may still devote money, time, and bandwidth for the privilege of playing them before they are complete. The review below critiques a work in progress, and represents a snapshot of the game at the time of the review’s publication. Some games succeed by presenting immaculately crafted worlds full of beautiful artistry and refined gameplay systems, while others excel for reasons far more ambiguous. At the latter end of that spectrum lies Rust, a multiplayer survival game from the creator of Garry’s Mod. In its current state, Rust is very much an alpha: crude, rough around the edges, and littered with bugs in serious need of fixing. But it also happens to be a wildly entertaining sandbox full of emergent gameplay and unpredictable player interactions. Rust is more framework than finished product right now, but it’s absolutely brimming with potential. The world of Rust is an unforgiving one with no clear goal other than survival. Threats to your existence come in the form of wild animals, zombies, and–scariest of all–other players. But the most immediate danger when you first begin is hunger. Armed with little more than a rock, you’ll likely find yourself chasing deer and wild boar across rolling valleys and dense forests in a desperate quest to fill your stomach. But use that rock to smash at trees and large boulders, and you can craft yourself a stone hatchet, making the task of hunting far more manageable (not to mention elegant). Indeed, crafting is a big focus in Rust, and something that plays a very large role in the game’s potential for open-ended entertainment. By collecting wood and smelting ore, you can construct everything from a basic shed to a sprawling compound fortified with spikes and watchtowers. These buildings are highly modular, allowing you to build a window here and a stairway there in order to create something that suits your own personal needs. You can also craft weapons and armor: bows to hunt wild animals, guns to hunt enemy players, or hazmat gear to venture into irradiated towns where you might luck into finding preassembled items. It’s a robust system, but it’s also clumsy and in need of refinement. Boulders and woodpiles are the most efficient places to gather resources, but they’re snatched up like precious diamonds in any server with a remotely decent player population and take ages to respawn once they’ve been claimed. You can spend hours wandering through the game’s sprawling map and return to your base with hardly anything to show for it. Beyond that, resource gathering is riddled with little oddities (like the way you gather cloth and chicken meat from a dead bear), and the inventory system is clunky at best. You never know what sort of characters you’ll encounter in Rust. But with any luck, those issues will be ironed out in future patches, because what’s in place right now has the potential to be a truly special open-world adventure. At any given moment in Rust, you might wander into a player-run trading outpost, get taken hostage by an outfit of roaming bandits, or happen upon an impromptu dance party with one player blasting techno through in-game voice chat while the others leap frantically about. It’s a co-op architecture simulator where you can work with friends to design a mighty base for your clan, or the cruelest of shooters where you can taunt unarmed newcomers by firing potshots in the terrifying pitch black of night. For a game with no narrative, it’s capable of generating one wonderful and bizarre story after the next. Yes, there’s still a lot of room left to improve. Guns carry all the impact of a wet towel, and character animations bear a strong resemblance to an infant taking its first steps. 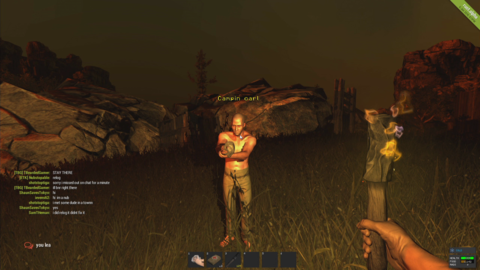 But the development team at Facepunch Studios has already implemented substantial improvements since Rust went on sale last month, including the recent addition of door sharing, which makes communal bases even more viable (previously, doors could be opened only by the player who built them), as well as technical improvements, such as improved grass effects and reduced strain on servers full of player-made buildings. At $ 20, Rust requires a real willingness to forgive its technical shortcomings in order to experience the emergent gameplay that makes it such a promising entry in the survival genre. But it’s a game that continues to improve with each passing update, and the potential that lies beneath those flaws becomes even easier to see. Whether or not you choose to buy it now, Rust is certainly a game to keep an eye on. $ 19.99, available via Steam. Tagged Access, Artistry, Boulders, Creators, Current State, Dense Forests, Desperate Quest, Early, Finished Product, Hatchet, Money Time, Privilege, Review, Rough Around The Edges, Rust, Spikes, Survival Game, Unfinished Games, Valleys, Wild Animals, Wild Boar, Work In Progress, Zombies.